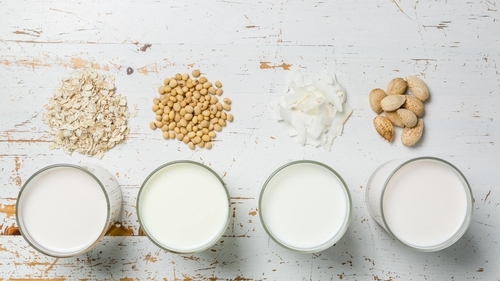 Know your soy latte from your almond flat white, with Liz Connor's guide to dairy-free milks. Not that long ago, regular cow’s milk was pretty much the only choice available. Now, supermarkets offer a variety of dairy-free milk alternatives, and you’ll often find the same at coffee shops and cafes, thanks to the rise of plant-based eating and better awareness of food intolerance and allergies. If you’re new to the dairy-free world though, and are curious about giving an alternative option a try, finding the right milk substitute can be confusing. Different ‘milks’ can offer different nutritional benefits, and each come with a unique taste and consistency that might be unusual at first. As well as being dairy-free, oat milk is unique in that it’s also nut-free and often gluten-free too. It’s made from blending steel-cut oats and water, and then straining the thick mixture to make a creamy and smooth liquid. Baristas say it’s particularly great in coffee, as it can be whipped into lattes and doesn’t curdle easily when heated. Oats are super-absorbent, which means the strained milk retains many of the grain’s important nutrients, like protein, fibre, and iron. Oats also contain beta-glucans; natural sugars that are thought to help improve cholesterol, heart health, and blood sugar levels. It has a relatively low-fat content too, with around 0.2g of saturated fat per 100ml. You’d have to have been living under a rock to have missed the hype around almond milk. The trendy dairy-free alternative has a rich texture similar to traditional cow’s milk, making it a hit with vegans and people who are lactose-intolerant. Regular almond milk is not as nutritious as cow’s milk, but fortified varieties often contain added vitamin D, calcium and protein. Look for varieties that don’t contain added sugar too. As it has a sweet and nutty flavour, it’s a delicious breakfast staple and a good accompaniment to cereals and overnight oat recipes. Soya milk is the original dairy-free alternative that’s kind of fallen out of fashion as other varieties have arrived on the scene. It still has some pretty impressive benefits worth taking note of, though. First up, it’s a good source of protein, containing around the same amount as cow’s milk. It’s also rich in vitamins A and B-12 and potassium, and you can find varieties that are fortified with calcium and vitamin D too. Soya milk is also cholesterol-free and has a low saturated fat content. It’s made from soybeans and filtered water, and has a distinct ‘love it or hate it’ savoury flavour. Soya milk is often thicker than other plant-based milk alternatives, making it a great replacement in recipes like pancakes and muffins. Prepare to hear much more about coconut milk (Jamie Oliver has been raving about it on Twitter). The white, milky substance isn’t made from the liquid found when you smash open a coconut – but instead by blending the fruit’s sweet white flesh with water. It’s probably more accurate to refer to it as ‘coconut drink’ because it’s actually a far more diluted formula than the type of coconut milk used in Thai cooking, which you usually buy in tins. One great thing about coconut milk is that it’s free from from major allergens including dairy, soya, nuts (despite the name) and gluten. Much like almond milk, it’s best to plump for fortified varieties if you’re cutting out regular milk altogether. Like the cooking variety, coconut milk has a deliciously fresh and full-bodied taste, making it perfect as a base for smoothies, on cereal, or simply enjoyed as a straight drink.